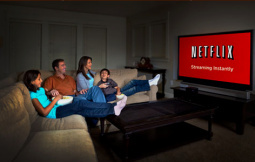 According to a new report from Sandvine, Netfix is where America spends most of its time. On any given night, between the hours of 9PM and 12AM, 65 percent of all Internet traffic goes to streaming services, and Netflix is the winner. For North America, Netfix accounts for 50 percent of all the streaming traffic during the period, followed by YouTube at 20 percent, Amazon at 1.8 percent, Hulu at 1.4 percent and HBO Go at just 0.5 percent. Says the report: "Audio and video streaming account for 65% of all downstream traffic from 9pm-12am and half of that is Netflix traffic [on North America fixed networks]. Prioritizing real-time applications like live audio and video is critical to maintaining a high quality of experience. Sandvine's video quality metrics, including display and transport quality, will be key to understanding the impact of major events like the 2014 World Cup which will likely be the most streamed event in Internet history." Perhaps most notably, the mean monthly data usage in North America increased by 120 percent from 23GB to 51GB, meaning the average consumer (or household) in the U.S. uses 51GB of data per month.